Korea was colonized by the Japanese government from 1910-45. The U.S. Military presence in Korea began at the close of the Pacific War in 1945. In 1948, the United States, in agreement with the USSR, divided Korea into two separate countries: the Republic of Korea (North Korea) and the Democratic People’s Republic of Korea (South Korea). The U.S. retains influence over South Korea's military. In 1954, the Mutual Defense Treaty was implemented, to ensure that the South Korea and the U.S. would be in each other’s defense if there was a threat of attack on either of them. Subsequently, the Status of Forces Agreement was signed in 1966, diminishing the power of Republic of Korea to enforce its own laws in cases where the U.S. did not waive its jurisdiction. 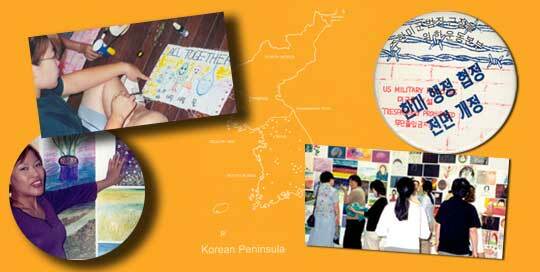 The Korea-US Free Trade Agreement was signed in June 30, 2007. If ratified, it will be the second largest agreement since the North American Free Trade Agreement (NAFTA). Military service is mandatory in Korea. Many young men serve as soldiers. They are ostracized if they are not in service. Many believe that joining the military will provide access to jobs. Korean women were taken as "comfort women" during Japanese occupation in World War II. Today, many women who work in bars around U.S. bases are from the Philippines, Central Asia and Russia. Daechuri - International students in solidarity with farmer's struggle in Daechuri and Doduri in Pyongtaek, Korea.